Surrounding by the beautiful Canadian Rockies, Monarch B&B is located in Canmore,Alberta.Our B&B was first established in 1996. Welcoming guests, families and Groups across the country. I am a Japanese chef with the skill to cook a North American style,Vegetarian or Japanese style breakfast. 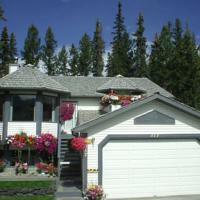 Come join us to enjoy a comfortable stay in gorgeous Canadian Rockies! We offer a unique, at home,reluxing environment. a tourist spot for decades. The beautiful scenery and great location makes it a popular town. Various types of Breakfasts to choose like Japanese, North American, or Vegetarian. Low Season Canada$135~ incl breakfast no tax needed.Rate change per person. Copyright © 2012 Monarch Bed And Breakfast All rights reserved.